In my husband’s family, the donut is sacred. It is something he has passed down to our 5-year-old, at least once a week I will wake up to find both my husband and daughter gone having woken up early to sneak out and try a new donut shop. They have tried almost all of the ones in are area and are slowly moving farther and farther away in search of the perfect donut. 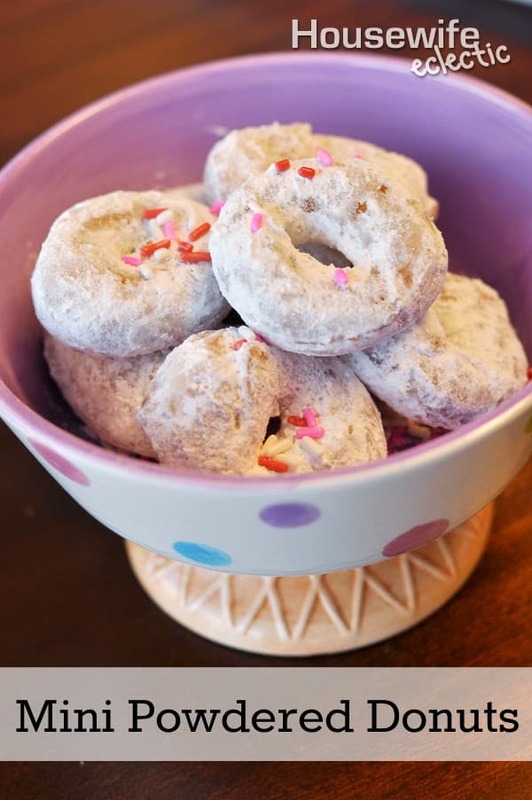 When they aren’t questing for the perfect donut, I like to appease them by making this fun and delicious powdered donut recipe. They love it and it is fairly easy to make. Mix the sugar, water and yeast into a bowl and let sit for about 10 minutes. In a different bowl, mix evaporated milk, eggs and salt together. After the 10 minutes mix the egg mixture into the yeast mixture. Add 3 cups of the flour and stir until mixed well. Add the shortening, stirring constantly while you add the rest of the flour. Knead the dough on a floured surface until smooth. Let your dough rise for at least 2 hours. Roll out dough to about 1/4 inch thickness and then use a small round cookie cutter or lid to cut the donuts. I use a lid from one of my spice jars. Add a small hole to the center of the donut with your thumb and then slowly stretch out the dough. Fry in oil heated to about 350 degrees until golden brown. Flip the donuts often to make sure the color is even. Drain the beignets for a few moments on a plate with paper twoels. Add your powdered sugar to a brown lunch sack. Then add the hot donuts to the sack, close and shake until donuts are covered in sugar. Then enjoy the delicious, airy-ness of these donuts. 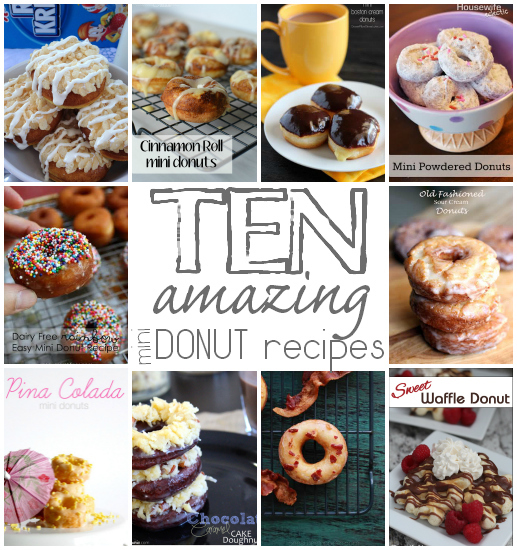 Make sure you check out the other 9 fabulous donut recipes participating in the hop today. Just click on the picture or title below to grab the recipe. I'm pretty glad those gorgeous donuts aren't sitting here in front of me right now. I'm pinning this, and if my husband is really lucky, some day I'll make them. They look fantastic! Seriously – how adorable are these! Can't wait to try them! My kids' favorite donut is a powdered. I'm definitely gonna have to try these! Powdered doughnuts have been a lifelong fav! Your recipe looks absolutely perfect. Pinning to my "Creative Yummery: Dougnuts" board. What a great tradition your family has!!! I hope they find their perfect doughnut soon… Yours look scrumptious! I always inhale powdered sugar when I eat these donuts, but they are classic nonetheless! Looks great! Powdery goodness jump in my mouth now! Seriously though, I think my boys would die for these yummy donuts! How cute and hole YUM! I can't wait to try these. That is a great bonding time for them.. We used to have a neighbor who made fresh donuts, and we all would flock there.. nothing like it. Yum, yum and yum! I need some of these in my life! I have never made donuts before, but I got a cake pop maker and I thought about making donut holes. I bet your recipe would work for that! I know some boys who are going to love these; and their dads too! Great post! Those look so good! I'd love to try them as gluten free! You can't go wrong with donuts, they look amazing! Powdered donuts are a weakness of mine! Those look so good! I've never made my own doughnuts before! I definitely want to try some. I've always wanted to make homemade donuts! Yum! Thanks so much for this recipe!